Disclaimer: Of course, I finally write a WFMW post and then realize it's supposed to be backwards this week. So, my backwards WFMW question is: How do you plan out your weekly menu? We always end up have a couple of good meals and then some nights where we don't really eat supper, we just have a snack or a bite of something here and there. Remember it's just two of us, but still...I would love to have a plan for supper every night. I'm just having trouble finding something that will work for me! 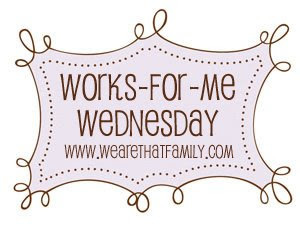 Okay, now on to the WFMW post I wrote about something that really does work for me! So a few months ago I found a great gift for my sister’s birthday. I chose my prints and the frame that I wanted, got to the check out and it was over $270.00! Just ordering the prints was going to cost over $150.00. Umm, my gift envelope hasn’t seen $150.00…ever. So, I decided I would make my own. 2. Print photos. I used a photo printer but it would be just as easy to print them at Walmart or Walgreens or wherever. The photos look best as black and white or sepia. 3. Drill two small holes in the top corners of each frame. 4. Thread ribbon through the holes in each frame. It’s best to thread a loop on both sides and tie the ends together on the inside so the picture and glass will cover the knot. Then thread each frame on the curtain rod. 6. Add the pictures and hang. My sister loved it and it looks great in her bedroom! I plan my weekly menu throughout the week. www.orgjunkie.com has a weekly meal plan link carnival on Mondays and I get my ideas from them. Then by Monday I have my meal plan and post mine too. I crockpot alot to save me on those nights were I just don't cook. Also, maybe freezing ahead meals would work for you. If you make say Chicken Tetrazzini (freezes beautifully) since it is just the two of you, make the full recipe in two smaller pans. Eat one and freeze the other to eat within the next month. There are just the two of us since our kids are grown and gone. I try to cook on Saturday and Sunday when I am at home and have time. I cook a double batch of something and a triple batch of something else. I freeze 1/3 of the triple batch for a future week (you might want to start out with triple batches both nights to bank a couple meals in the freezer). On Monday we eat what was left from Saturday, on Tuesday what was left from Sunday. On Wednesday we have a meal from the freezer. We both are usually at a church meeting on Thursdays so we grab whatever is around - sandwich,etc and have breakfast for Friday night. Of course this doesn't work if the kids drop by over the weekend - but I think stopping at our house at meal time is part of their menu planning! Maybe this will give you some ideas! You could always eat with your in laws. I'm not wonderful at planning for a week of meals, but when I do... (and I'm usually cooking for just me) I pick a theme for a week and use similar ingredients in each meal. The theme could be a ethnic type or an ingredient (ie: tomatoes or spinach or squash...)I love making huge batches and freezing them for when I don't feel like cooking (or washing dishes). Thanks for sharing your instructions on this! I love it! I'm trying to get better about planning, especially with ball season cranking up for us. I like to use my crockpot a lot too. And I try to work it where we'll have leftovers on those busy nights that I'm not going to have time to cook. Most everything I fix, we get 2 meals out of it, so if I plan just right, we're just reheating on the busy nights. I have the most time to cook on the weekends, so I make sure I shop before the weekend starts. I write down 4 or so meals I want to make and the general day to make them, but if I switch things around a bit it doesn't really matter. I don't like to get too locked in. On Thursdays we host a bible study at home with some college students, so I make that my big crockpot meal or something substantial like lasagna (easy to make in a huge batch). We usually get takeout one night a week or less, and that gets me through a hard day with the kids. Keeping it planned but loose works for me!